The current policy of Prime Minister Narendra Modi is quite focused on developing the Indian economy. JanDhan Yojana was born out of this objective of the PM and under this Yojana, PM Narendra Modi had launched the Micro Units Development and Refinance Agency or the MUDRA Bank on 8th April’15. MUDRA is a financial initiative by PM Narendra Modi, crated in order to facilitate the micro units and provide them sufficient funds in order to develop. Small businesses are often unable to avail loans from banks because of lack of collateral and insufficient funds to pay off the interest. There are almost 577 crore small businesses currently functioning in India. According to the PM, helping these businesses grow would in turn lead to the development of the Indian economy. Hence, this scheme was launched. MUDRA is still not a fully fledged bank and is in its initial stages. What is the MUDRA Loan Categories? This is a scheme to provide loans to small businesses and micro institutions. For now, it will just refinance these institutions. Under the Shishu stage, MUDRA will provide a loan up to RS.50, 000 to small businesses. Next is the Kishor stage. 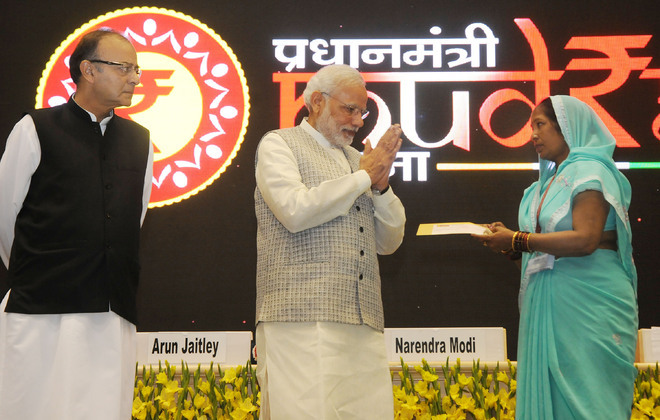 Under this stage, MUDRA will provide loans of an amount ranging from RS.50, 000 up to Rs.5 lakh. Last stage of intervention is the Tarun stage. Under this stage, loans of amounts ranging from Rs.5 lakh to Rs.10 lakh will be provided. What are the objectives of the MUDRA Loan Yojana? MUDRA Yojana is launched keeping in mind various objectives to be fulfilled throughout the implementation of this scheme. To get all Micro Finance Institutions and entities registered and regulate the same. To help small businesses grow and develop their enterprise further. To assist lower income groups in setting up and developing their business. To help set up responsible financial practices in order to prevent over borrowing for lower income entrepreneurs. To help create easy access to finance for the unbanked and also help lower the cost of finance. To give SC/ST preference in lending. To regulate all Micro Finance Institutions dealing with manufacturing, service and trading. Thus, MUDRA Loan will help all small businesses gain easy access to finance and regulate the policy guidelines for the same. Who is eligible for loan under MUDRA Loan Yojana? Under the MUDRA Yojana, all small businesses and enterprises in need of finance are eligible for a loan. How to apply for a loan under MUDRA Yojana? All Scheduled Commercial Banks in public and private sector. These institutions have to pass the eligibility criteria laid down by MUDRA yojana and are then eligible to provide loans to suitable candidates as per the common parameters, under the PM MUDRA Loan Yojana. When the loan is passed, one will get a MUDRA card, similar to a credit card with limit up to 10% of loan amount to purchase working capital. Self attested proof of identity along with the loan applicant’s 2 passport size photographs. Quotation of items and machinery to be purchased. Details of suppliers and machineries as well as other items to be purchased. Identity of ownership of business and business address along with copies of necessary licences and certificates. Proof of category life SC/ST and others if any. What are the benefits of MUDRA Laon Yojana? First off, no necessary collateral or loan application fee is required to place an application for loan. Apart from this, another key feature of this scheme is that its interest rate is only 1%. With such key features , easy access, systematic guidelines and low cost of finance, this will indeed help the small businesses and entrepreneurs from lower income groups to develop and grow and increase their social upward mobility and in turn develop the country’s economy as well. Alleviation of poverty from India. Staying in tune with these philosophies, Jaitley announced that in Budget 2016-2017, the government had set a target of lending INR 1.22 lakh crores under the flagship MUDRA Yojana to help reviving and supporting the MSMEs or Micro, Small and Medium Enterprises. The lending target was not only accomplished but was actual overshot by a huge margin. Hence, in light of the previous success, the government has decided to double the target for lending under MUDRA yojana. This means that the lending target will now be set at INR 2.44 lakh crores. The Union Minister, Mr. Kalraj Mishra supported this move by Arun Jaitley and stated that the small entrepreneurs in this nation will be greatly benefited by the increased lending target as set by the budget. According to Mishra, the increase lending target will gain some support through the measure of cutting down on taxes for smaller firms with a yearly turnover of INR 50 crores or more. Because of the demonetization drive, the MSMEs faced some serious challenge and took a hit. The reduction in income tax and scope for increased loans under MUDRA will provide the MSMEs with the necessary boost to improve their businesses and grow. Arun Jaitley said that though the lending target is being scaled up in this budget, the primary targets will be women, minorities, backward classes, Tribals and Dalits who have been historically stripped off of the opportunity of getting finances for businesses. It is worth mentioning that the income tax for the MSMEs have been reduced to 25% but only for those companies which have yearly gross turnover of INR 50 crores or more. Also, the government will be focusing on developing skills of Indian Youth so that their employability can increase and that the MSMEs can get fresh and skilled workforce to improve their business operations and reach optimal productivity with minimum costs – a breakeven point where productivity exceeds cost inputs. Rs 96 cr has been distributed under this scheme.